Have you experienced a situation when your iPad won’t respond to a command? Or you try to open an app and it crashes every time the app launches. If yes, then trying to reboot iPad seems like a viable method that could fix the issue. Well if you are experiencing some kind of working problem on your iPad, then you must learn some things regarding iPad restart methods. What is an iPad Restart and Force Restart? An iPad Restart is a simple method to turn off your iPad and then turn it back on. It is very easy to restart iPad, the complexity lies in the force restart method. The simple restart only switches off and on the device, but the force restart cut the power supply of the device for a few seconds and then connects it while turning it on. Thus, it is important that you learn how to restart iPad and also perform a force restart. There are various situations where a restart would come in handy to fix errors and working issues in the iOS devices. So, whether you perform a simple restart or a force restart, there are high chances that the reboot iPad will fix the problem. Although the force restart is more effective than the simple restart, the situations in which you can try the methods are quite similar. iTunes doesn’t recognize the device. There can be some more issues that can be fixed with a restart like a device stuck in recovery mode or can’t switch between apps, etc. But the restart is mostly useful in such cases to resolve the issues. First, try to restart iPad, normally. This will be the first effort towards fixing the device. Simply, turn off and turn on the device, to see if it's working. If you fail to do it, then move on to the next method. Step 1; Hold the Power button until the Slider is visible on the screen. Step 2: Then, swipe the Slider to turn off the iPad. Step 3: Then, simply turn it back on by holding the Power button. 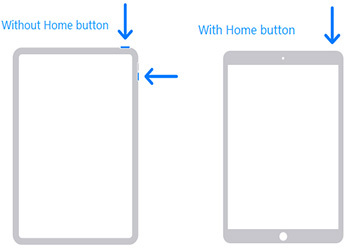 This is the conventional method to restart an iPad, if this works then the device is working properly, otherwise, you need to make a Force Restart of the device by pressing specific button combinations. You need to press and hold the Power button and the Home button at the same time. Let them go when you see the Apple Logo. Try not to hold the buttons too long, or you will enter Recovery Mode. Usually, making a Force Restart fixes some minor problems with the device. If the iPad is frozen or disabled and you are unable to restart the device then you can use official iTunes app to restore the device to fix it. But restoring the device with iTunes comes with its fair share of problems, the most devastating one is that you will lose all the data from the device. You can make a backup of the device to restore from it at a later time but instead of that, you can also use Tenorshare ReiBoot to fix the iOS and restart the iPad. It also helps to fix many other problems such as iPad won't turn on, iPad disabled, Apple logo, iPad keeps shutting off and more. Step 1: Download and run the Tenorshare ReiBoot tool on your computer. As soon as you have installed the software, link your device to the computer employing a USB cable. Click on "Repair Operating System" alternative. Step 2: If your iPad is free of any issue, you will see below screen. In spite of this, you can select "Start Repair" to enhance the performance of your iOS. Step 3: Get the firmware package online. The tool will show the related firmware package for your device. It will show the newest firmware package for the current iOS that your device is operating on. Start the procedure of fixing the problem that your device is facing. Soon after the package is downloaded completely, select "Start Repair" to start the recovery of your device. The procedure may take hardly 10 minutes. If you were having trouble to restart your iPad then you shouldn't anymore. Numerous ways of restarting that device has discussed above in the article, starting with the regular way of restarting the device. If that does not work you have Force Restart but if still fails, you then there is clearly something wrong with the iOS. You just have to make a factory reset iPad with iTunes to fix it but it will also delete all the data so we recommend using ReiBoot.